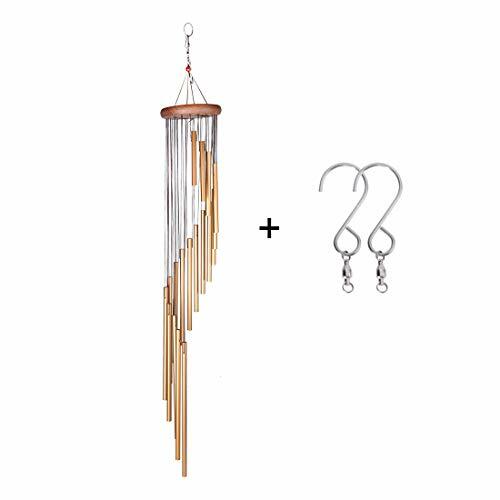 36'' Long Large Wind Chimes Easy to Install-With 2 Free Hooks can be used for any hanging work.Comes with a Round Ring, just hang it the wind chime will swing with wind and pleasing your ears. Durable Craft - The wind chimes is made of premium quality aluminum alloy that can last for long time use. The hanging top plate is made of solid red wood. The large wind chimes package also include 2 stainless steel hook as gifts for every customer. The hooks can be used for any hanging work to resist water and wind damage. Melodious and Clear Tune-The wind chimes is made of 18 tubes of different length. Every tube is 1 cm bigger than the other. The longest tube is 10.8". The large wind chimes package also include 2 stainless steel hook as gifts for every customer. The hooks can be used for any hanging work. Notice: As the wind chimes has 18 strings, it may easy to get tangled when you put it away. Perfect Decoration Indoor and Outdoor - The wind chimes are integrated with beautiful sounds and attractive design, decorate your home, room, patio, balcony,garden, and anywhere you wish to decorate.